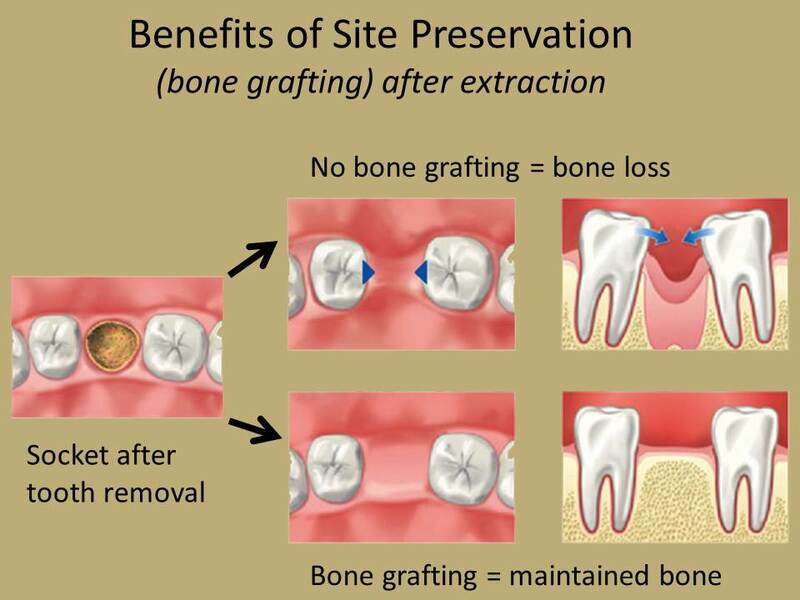 Bone grafting or bone augmentation is necessary when there is not enough quality and quantity of bone material surrounding either the implant area or that of the surviving roots. Bone reduction occurs naturally over time and is the reason why implants should be placed very soon after extraction. Whenever a tooth is lost or extracted a considerable amount of the bone that once surrounded the remaining root portion may disappear. This loss can be particularly rapid during the first few months and is described as 'bone resorption'. Although the rate and amount of bone resorption is highly variable between individuals, it will always occur to some extent, unless specific care is taken to reduce its effects. Sometimes, the simplest measure to minimise bone loss after an extraction is to place the implant immediately (if there is no infection) or within the first few weeks. This is one of the most important features of dental implants. Once in place, everyday's functional forces stimulate the surrounding bone which responds by becoming stronger and denser. Like all things there are limits to how much work an implant can do. The dentist will clearly explain this in more detail. What can be done to rebuild supporting bone? In the upper jaw, above the molar teeth, it is possible to increase the height of bone available by using artificial bone material or harvesting one’s own bone. 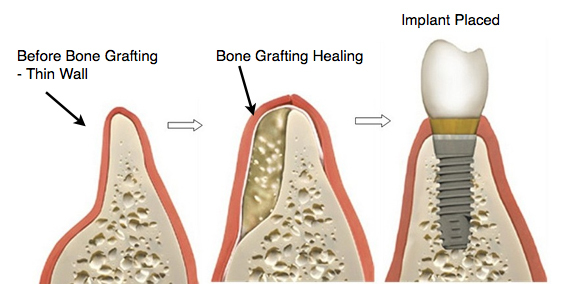 This procedure is called 'bone grafting, augmentation or regeneration'. A skilled surgeon can deliver very predictable results in this location. Without the general success of this method, many patients would be unable to have implants in a part of the mouth where teeth are so commonly missing. This procedure involves elevating the sinus membrane and placing the Bio Oss bone graft onto the sinus floor, allowing implants to be placed in the back part of the upper jaw, so that implants of adequate length may be placed. This procedure has been performed successfully for over two decades now and is considered an accepted and predictable method of bone grafting. New bone can take anything from 3 to 6 months before it is ready to receive dental implants. However, sometimes it is also possible to carry out bone grafting together with the implant surgery. This always depends on individual circumstances and the treating surgeon will decide if it is a possibility. Do not be in a hurry to move to the next stage. If you need a large volume of bone it will take longer to mature than a small amount.